Sambucol®, the original Black Elderberry extract, provides strong immune system support to help you and your family stay healthy throughout the year. 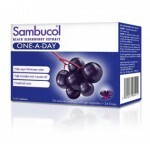 Developed by a world renowned virologist, Dr. Madeleine Mumcuoglu, Sambucol® is the unique black elderberry extract that has been used in scientific studies. 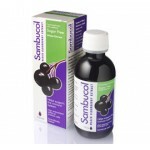 By using a proprietary method of extraction, Sambucol® can guarantee consistent, immune supporting properties in every serving. Certain flavonoids – anthocyanins – are found primarily in the pigments of dark blue and deep purple fruits such as the black elderberry. It is these that have a remarkable ability to stimulate the body’s immune system and are thought to work to protect the body’s cells from the potential damage caused by free radicals. Sambucol is considered to combat cold viruses by suffocating their activity. Key point: proven to reduce duration of cold or similar virus. Preferred version of this remedy includes Vitamin C and Zinc.